As we reported before the official name of the Apple Tablet was released, Fujitsu already had a device named the iPad and the trademark locked down. "It's our understanding that the name is ours," Fujitsu PR director Masahiro Yamane told the New York Times. Fujitsu first released the iPad in 2002 as a point of sales device and applied for the "iPad" trademark in 2003 specifically covering handheld devices used in retail. Along the way, the application got bogged down because a company called Mag-Tek had already registered IPAD for its line of PIN-entry keypads, and Fujitsu's application was listed as "abandoned" in April of 2009. The notice of abandonment apparently woke someone at Fujitsu up, because the company then asked the Trademark Office to re-open the application, arguing that Mag-Tek's IPAD had nothing to do with the Fujitsu iPad. 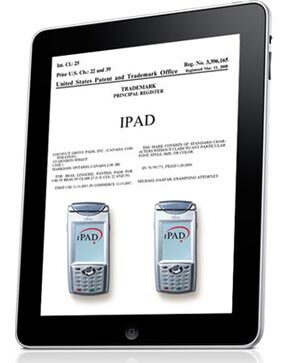 The USPTO agreed, re-opened the application, and the process continued until September, when the iPad application was published so other trademark holders could oppose registration. That's when Apple signaled that it wasn't so happy about things -- and filed its own "iPad" trademark application using a shell company called "IP Application Development." That leaves us at now, with Mag-Tek selling the IPAD under a valid, registered trademark, Fujitsu selling an iPad with a pending trademark application, and Apple sucking all the air out of the room with the launch of the iPad and no US trademark at all. Not sure about the boomers, but the boomers parents are definitely a good fit for the new iPad. With a good WiFi network in the home, put there by the tech savy boomer kids, they can finally get on the net without having to deal with all the other technology involved in PCs/Macs that they don't need and don't want to deal with. This will let them access net content and email easily. And for the more tech savy, I think this will provide a good web surfer/email access point for use, mainly in the home, while watching tv, listening to the stereo (the good one in the living room), etc when you don't need the power of the laptop or desktop. I know I will consider it for that purpose alone. The books I'll leave on my Kindle--it does that job better anyway, but I might consider magaziines on the iPad. Also, as a pilot, I predict that the iPad will finally provide a computer based electronic flight bag that works as well as pilots want it too without the hassels of dealing with Microsofts' bugs. With the touch screen, good battery life, and GPS it should meet the promise of excellent web based flight planning with flight tracking and integrated approach plates and good quality charts. I just wonder if anyone can have an example by Oshkosh in July.